Each year young adult volunteers from Greater MetroWest receive intensive training in Israel and then spend 10 days as counselors at the camp followed by a tour of historic Kiev. During Rosh Hashanah, Hesed Dorot sponsored a festive celebration dedicated to rejoicing the beginning of the year 5773. On the second day of the holiday, there was a festive meal. Speakers were the Head of United City Community, David Letichevsky; Chairman of the board of the Charitable fund Hesed Dorot, Yuriy Horoshchanskiy; and Fund Director Dmitriy Spivakovskiy. Chief Rabbi of the Cherkassy region, Dov Akselrod, blessed the community and blew the shofar. o The children’s band Tsiporim. o The Hesed choir Galibte Nigunem. Later on, in the evening, the members of the Cherkassy Jewish Community of Progressive Judaism, Haver, gathered together to celebrate the beginning of the new year. 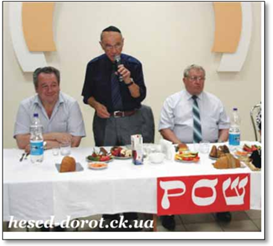 · Websites' catalog: UA: Cherkassy: Jewish welfare fund "Hesed Dorot"